This software drives innovation in emerging technology by standardizing software and liberating resources. In fact, the first Auto ID solutions in the Industry were built on open technology. And these same open technologies are defining the future of Aircraft Auo-ID. Using on field customization Service based on an intuitive “wizards,” to allow easy design of custom forms with data entry and/or web based templates. FLYplug package can read from most Databases (ODBC, OLE DB and even non-Windows such as AS/400, Sap, LINUX, Oracle …), spreadsheets or texts. Launch of « print/encode jobs » direct form the platform, TCP/IP sockets, emails, files or other trigger event. FLYplug package solution is what the OEMs are expecting to switch smoothly from labeling to ATA spec2000 RFID marking not investing in a costly IT project. Select data using the simplest pick list or the most sophisticated SQL query. The Query screen offers a simple way to define complex searches. FLYplug’s AIDC Enterprise Software ATA Spec 2000 distribution package makes it easy to access text, spreadsheets, and databases. This includes ODBC and OLE DB support for dozens of data formats – even non- Windows platforms such as LINUX, AS/400, Oracle database, and more. Supports also live design-time data view and print-time data merging. To support security audits and ensure that automated print jobs succeeded, the Automation editions provide extremely detailed logging of print job information, template images, warnings and errors to SQL databases. Automatic e-mails of warnings and errors tell you about problems immediately. Control FLYplug’s AIDC Enterprise Software ATA Spec 2000 distribution package from within your other software, users don’t even have to know that it’s really doing the printing. Automatically process XML print requests from Oracle’s WMS and MSCA applications. Certified interface to the SAP Auto-ID Infrastructure (AII) of the NetWeaver platform. SAP IDocs are also supported. Process XML print requests from IBM Sensor Events (formerly Premises Server and Premises RFID Server) and return print status. 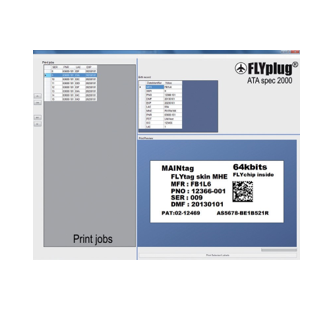 The FLYplug’s AIDC Enterprise Software ATA Spec 2000 distribution package integrated light middleware utility allows programs that can’t directly control to launch print jobs anyhow. Trigger using files, e-mails, serial ports, or TCP/IP sockets. The light middleware utility then “wakes up” , which reads the data and generates “print-job”. Although, running on Windows, it doesn’t care about the operating system from which triggering events originate. The Automation editions provide Microsoft ActiveX support for even the most advanced integration challenges. The FLYplug’s AIDC Enterprise Software ATA Spec 2000 distribution package supports the return of job status information to controlling applications. The FLYplug’s AIDC Enterprise Software ATA Spec 2000 distribution lets numerous network users specify, launch and route print jobs for processing by a single copy of the distribution. XML Enabled Printer configuration and template download. Key Pad Devices that attach directly to printers. SAP Integrations that use SAPscript-ITF. Custom Programs for any OS (both mobile and desktop). FLYtag® selected by Airbus for the A350 XWB’s first RFID parts marking program, has become the standard for the aviation industry. FLYtags are designed for identification and maintenance, repair and overhaul tracking applications throughout the civil and military aircraft and aerospace industries.